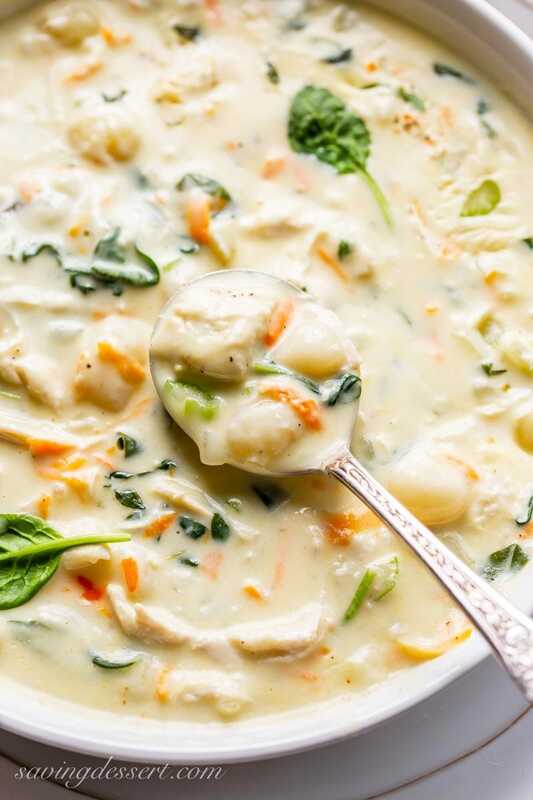 With a silky, creamy broth, tender chunks of chicken, loads of fresh spinach and pillowy soft gnocchi, our Creamy Chicken Gnocchi Soup is comforting, easy to make and super satisfying! Are you a fan of Olive Garden Restaurant soups? 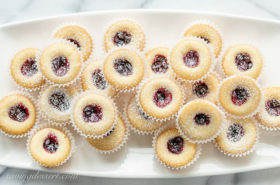 While this didn’t start out to be a copycat recipe, it must be pretty close! 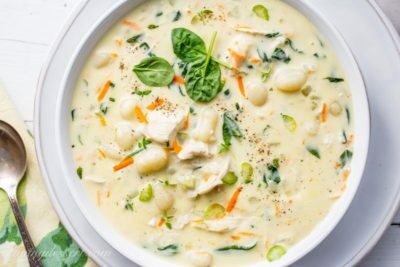 We were so thrilled with our Hearty Beef & Gnocchi Soup recipe I decided to bring gnocchi to a pot of creamy chicken soup too. I started with a base from our delicious Chicken Pot Pie Soup and then added shredded carrots instead of diced and loads of fresh baby spinach. The vegetables are crisp tender, the gnocchi is dreamy soft but not falling apart, and the broth is flavorful and surprisingly light. We enjoy eating out sometimes but often find the sodium content in restaurant meals to be ridiculously high. I try to watch my salt intake daily, and all those other things I shouldn’t be eating regularly, but one bowl of OG soup has about twice the sodium I usually consume in one day. While our soup recipe needs a little salt, I find adding loads of fresh ground black pepper and plenty of fresh thyme to be the magic makers. Sometimes creamy soups with chicken can be a little bit flavorless, but not this soup! It doesn’t taste milky or bland, and I don’t think you need a lot of salt to add flavor. 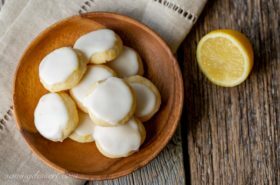 You can use whole milk or half-and-half or a combination of both. Chicken broth or chicken stock is fine too. I enjoy making soups with the gnocchi found in the pasta section of the grocery store. It’s vacuumed sealed and keeps without refrigeration for a long time. However, if your store carries fresh pasta, you might look there for a package of gnocchi too. And if you’re looking for a little dumpling fun, try making your own with our Homemade Potato Gnocchi Recipe complete with how-to video! Using pre-made gnocchi instead of potatoes is a wonderful way to speed up the process of soup making. The onions and celery are finely diced, and the carrots are shredded so the vegetables cook quickly. Gnocchi is cooked through in just a few minutes and spinach wilts almost immediately in the hot broth. Using shredded rotisserie chicken or pre-cooked chicken breasts is the final key to cooking this soup up in less than 30 minutes. And leftovers are so fantastic! P.S. Don’t forget to serve with a big piece of crusty bread to dunk in the broth, it’s heavenly! Let’s be cooking friends! 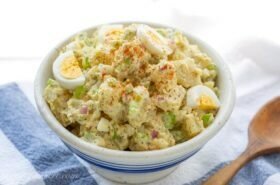 When you try our recipe please feel free to leave a comment on this post. I’m sure your experience and insights will help all our readers, and me too. Also, if you’re on Pinterest feel free to leave a comment and photo there if you have one! If you share on INSTAGRAM tag @savingroomfordessert and hashtag #savingroomfordessert so we can stop by and give your post some love. 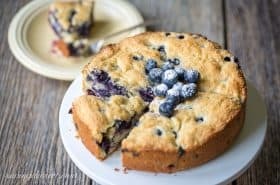 And we’d be very happy if you’d FOLLOW Saving Room for Dessert on FACEBOOK| INSTAGRAM| PINTEREST | TWITTER and subscribe to our YOUTUBE channel for all the latest recipes, videos and updates. Thank you!!! Melt the butter in a heavy bottom Dutch oven or soup pot, over medium heat. Add the onion and celery and sauté until the vegetables are slightly soft, about 5 minutes. Add the carrots, flour and thyme leaves and stir until all vegetables are covered in the flour. Continue cooking and stirring the vegetable/flour mixture for 2-3 minutes. Stirring constantly, gradually add the chicken broth. Bring the soup to a simmer then reduce the heat to low, cover the pot and simmer (stirring occasionally) until the vegetables are tender, about 15 minutes. Remove the lid and add the half-and-half, gnocchi, chicken and spinach. Cook gently (do not boil) until the gnocchi rises to the top and the chicken is warmed through, about 5 minutes. Taste and season with salt and plenty of black pepper, as needed. Serve immediately with crust bread for dipping. You can find gnocchi in the dried pasta section of most grocery stores. Look for a vacuum sealed package. Creamy Chicken and Wild Rice Soup – this delicious soup checks all the boxes for a perfect bowl of fall comfort food. 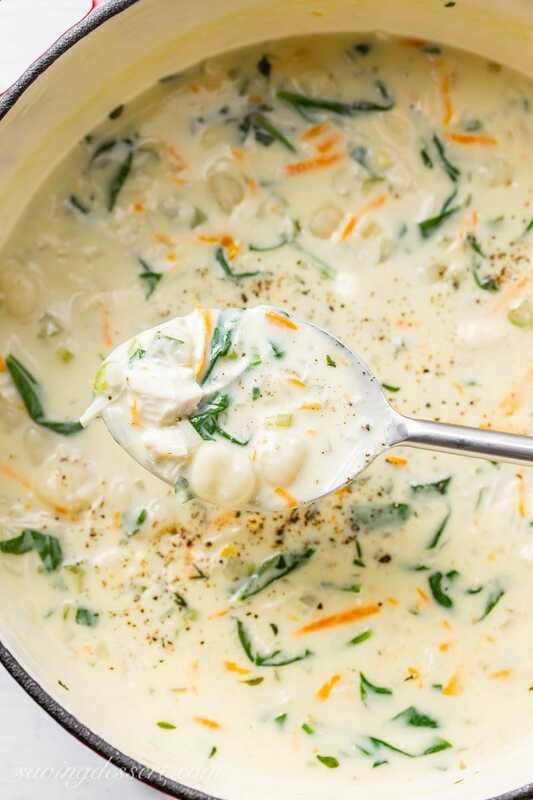 It’s creamy and hearty with a nutty bite from the wild rice and a wonderful, flavor packed broth. 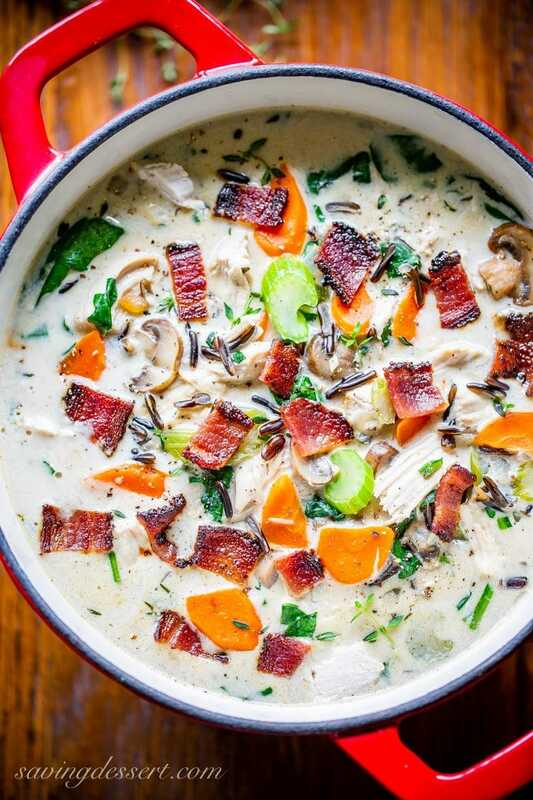 Click HERE to get the recipe for Creamy Chicken and Wild Rice Soup. 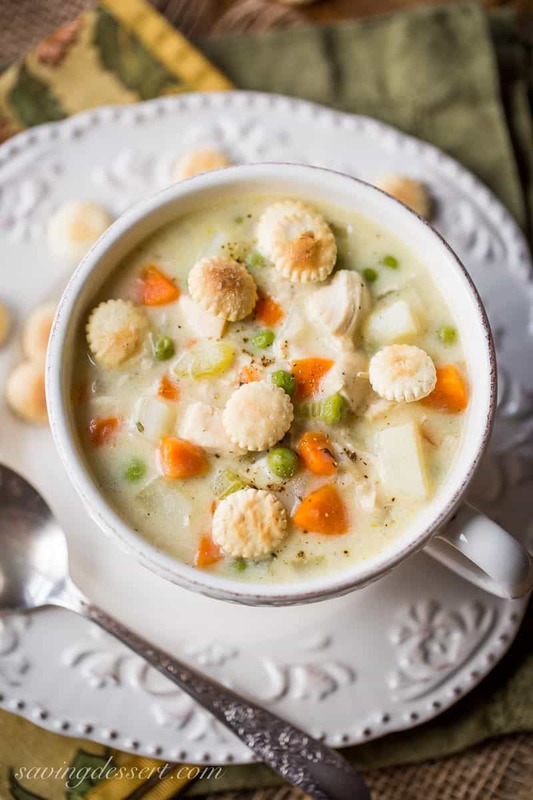 Hearty Chicken Pot Pie Soup ~ a creamy chicken soup with potatoes, peas, onion, celery and carrots. All the flavors of a homey chicken pot pie without the crust! Click HERE to get the recipe for Hearty Chicken Pot Pie Soup. There’s nothing like making a big pot of soup in a heavy, enameled cast iron Dutch oven. This less expensive brand performs well and is great for everything from browning, braising, stewing and for making casseroles and even bread! This Dutch oven works well on all types of stove tops such as gas, electric, glass stovetop, it’s induction safe and oven safe to 500ºF. Click on the photo for more information. Delicious! Only change I made was to add a little bit of poultry seasoning! I love this soup! I don’t think I’ve ever put gnocchi in soups before. Tortellini, yes, but not gnocchi. I have no idea why not! Plus, it’s so pretty. Love the spinach in it, also. Thank you Mimi – you are so sweet. 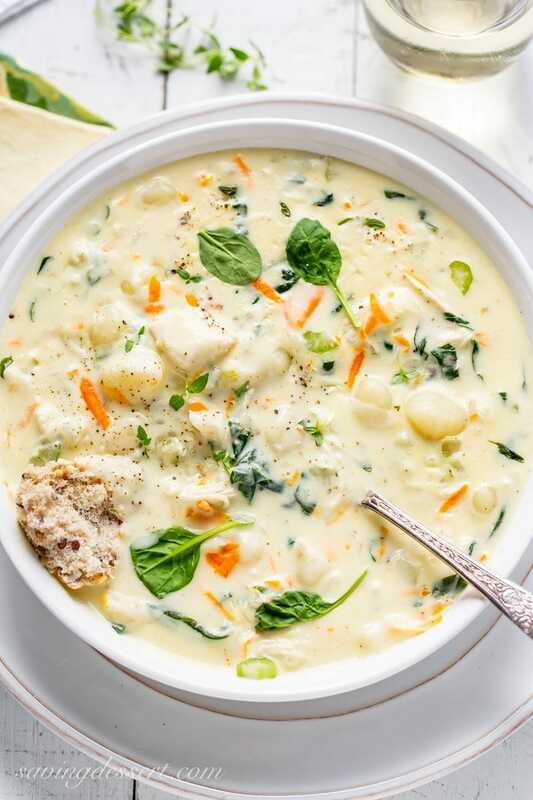 I know you’re going to love gnocchi in soup – it’s just wonderful! Sometimes I forget when I’ve commented on IG or here 🙂 I loved this the second I saw your photo on IG. It truly looks delicious and so comforting on a cool, damp evening. You are so sweet Susan – and I appreciate you reading and commenting very much! Have a lovely weekend. What a great soup for the cooler days. I love the gnocchis in it. Thanks Gerlinde – we do too! 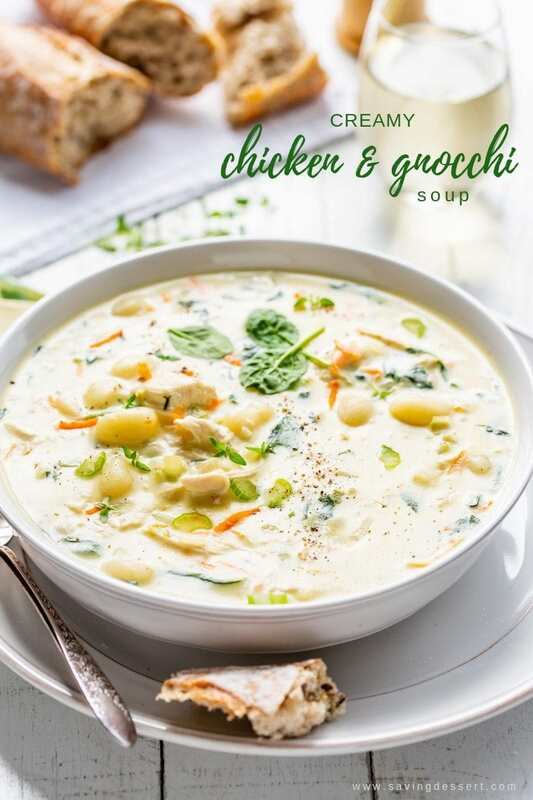 Loving your gnocchi soups, I’ve got to try, they sound so comforting! 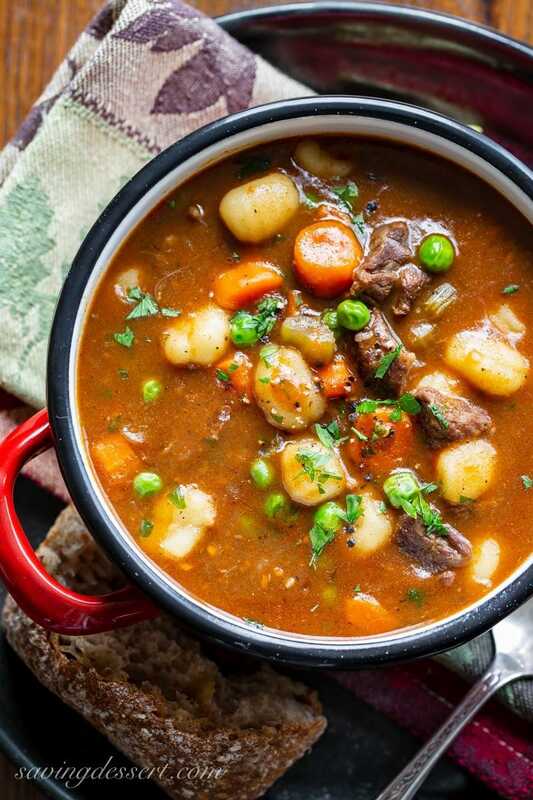 Whoa… what a beautiful and hearty soup! 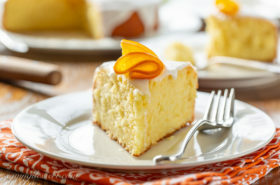 It looks good enough to serve at a dinner party! Sorry about your soup Monique – you might be surprised how many recipes I go through until I’m happy with the final version. I bet you’ll love gnocchi in soup – it’s so pillowy soft. Yummy stuff! What a wonderfully creamy and flavourful soup! And as always, great shots, Tricia! Thanks Angie – so loving soups these days! Good looking soup Tricia. I’ve been meaning to buy some gnocchi to give them a try in something. Thanks Larry – hope you get the chance to make this luscious soup!